Nepal is one of only five countries that have reduced under-five mortality by 50% since 1990, however pneumonia remains one of the primary causes of death for Nepali children (15% of under five deaths in 2015). 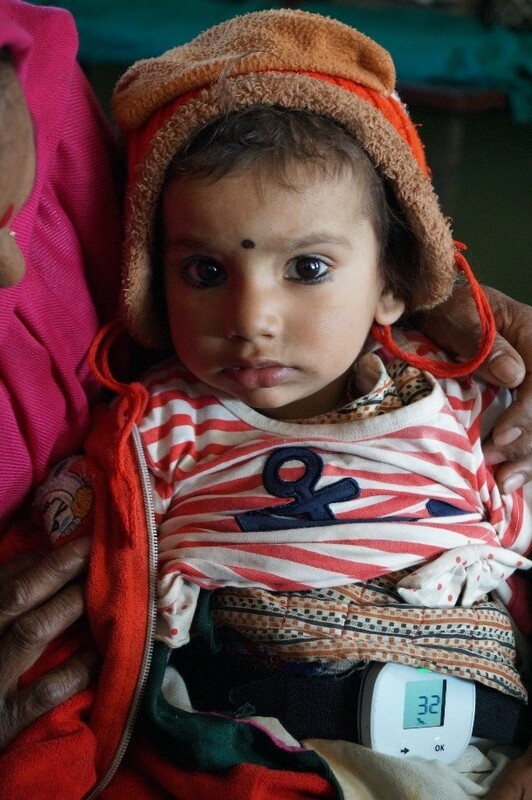 In rural areas, the government relies on the country’s 50,000 Female Health Community Volunteers (FCHVs) to provide maternal and child health care. Although 42% of these women have never been to school they have been trained to diagnose a number of illnesses, including pneumonia, and provide essential care to young children on a daily basis in the most remote areas where Health Posts are hard to reach. As part of its Acute Respiratory Infection Diagnosis Aid (ARIDA) project/study, Malaria Consortium (MC) went on a scoping mission to Nepal end of January and visited an FCHV in a valley outside Kathmandu. Guta Kunwor is 38 years old and she has been an FCHV for 12 year. Her aunt was an FCHV before her and she used to accompany her to trainings at the local Health Centre. On average, she sees three children with cough or difficulty breathing every week. When children present with those symptoms she counts their respiratory rate (RR) for 60 seconds according to the Integrated Management of Neonatal and Childhood Illnesses (IMNCI) guidelines and refers them to the nearest Health Post if she diagnoses fast breathing. So far, Guta has been using the ARI Timer, a device which works like a stopwatch whilst she is counting the child’s breaths by watching their stomach moving with each inhalation and exhalation. The ARIDA study is focused on testing an automated device which is strapped to the child’s belly and automatically counts the child’s breaths. It also reduces the assessment time from five minutes to merely a couple of minutes. When we told Guta about this new device, she spontaneously thought of an analogy which rang very true: she said that using the ARI Timer was a little like touching a child’s forehead and yours at the same time to check for fever, whilst using the ChARM device was more like using a thermometer to get a reliable diagnosis. This stage of the ARIDA study is looking at the acceptability of this new automated device under a number of specific themes: affective attitude, burden, intervention coherence, perceived effectiveness and self-efficacy. The results should show whether FCHVs and health facility workers (HFWs) using an Acute Respiratory Infection Diagnostic Aid (ARIDA) can adhere to the IMNCI algorithm, and should help us better understand FCHVs’ and HFWs’ perceptions on the benefits of and barriers to using this new device. Alice Maurel is Senior Programme Officer at Malaria Consortium. Alice visited Nepal in January 2018. Find out more about the ARIDA study in our project brief here. The ARIDA study is funded by the La Caixa Foundation and UNICEF in collaboration with the Federal Ministry of Health Ethiopia, Federal Ministry of Health Nepal and Ministry of Health Mozambique. Government of Nepal MoH. Annual Report, Department of Health Services, 2015–2016. 2016.